It is a great joy for to have this occasion to speak to you and send forth the graduating Class of 2015. I had the privilege of teaching and serving here for 7 years. In so many ways, Holy Family Academy formed who I am today as an educator. One of the great foundational concepts operative here at Holy Family Academy is that formation is a part of the educational mission. So Class of 2015 and future graduates, while you deserve much congratulations for your great accomplishment, my wish and challenge for you is that you continue your education and formation that you started here—that you thirst for more. In a just a few minutes, I would like to discuss how formation occurs and why we should thirst for more. To better understand the nature and role formation at a Catholic school, it is necessary to reflect upon an age-old concept that was most notably articulated by St. Thomas Aquinas. This concept is something called connaturality. Let’s take a look at this passage from the Summa. Now rightness of judgment is twofold: first, in accord with the complete use of reason, second, on account of a certain connaturality with the matter about which one has to judge. Thus, about matters of chastity, a man after inquiring with his reason forms a right judgment, if he has acquired the knowledge of ethics, while the one who has the virtue of chastity judges of such matter by a kind of connaturality. Accordingly it belongs to the wisdom that is an intellectual virtue to pronounce right judgment about divine things after reason has made its inquiry, but it belongs to wisdom as a gift of the Holy Spirit to judge aright about them on account of connaturality with them. Thus Dionysius says (Div. Nom.ii), ‘The man of God is complete in divine things, not only by learning, but also by suffering divine things (patiens divina).’ Suffering with God and connaturality with God (compassio et connaturalitas) is the result of charity, which unites us to God, according to 1 Cor.6:17: Anyone united to the Lord becomes one Spirit with him. Consequently wisdom which is a gift, has its cause in the will, which cause is charity, but it has its essence in the intellect, whose act is to judge aright, as stated above.” (Summa Theol., II-II, q.45, a.2). This passage is obviously very complex. We could easily spend a whole semester exploring the different aspects of connaturality, but I think there are a few simple things we can get from this passage that will serve us well. The first thing to notice is that St. Thomas clearly distinguishes connaturality from the “use of reason.” So we could say that gaining knowledge through connaturality would be different from textbook or classroom type of learning or instructional learning. Second, we should notice that connaturality is associated with virtue, which is doing things rightly, not necessarily just thinking rightly. Third, and perhaps most importantly, we should see that connaturality is a gift that comes from compassio, or a kind of suffering with God. This presupposes a receptivity to God’s gift. In other words, we have to be open to knowledge through connaturality. So what’s the point of talking about connaturality in the context of education and formation? The point is that the human person is not just a thinker; he is also a receiver. That’s not to say that knowledge through the use of reason is not also a gift. 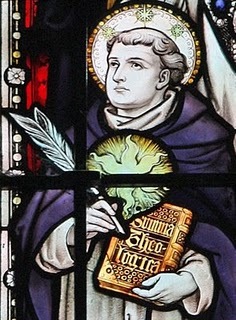 However, St. Thomas is pointing out that we receive knowledge in other ways besides from conventional instruction. Knowledge can come from a certain closeness or openness to God, which is lived out through virtue. Understanding the role connaturality can play in education casts great importance to even the smallest details of daily life at a school. Indeed, for a school to be successful in imparting a connatural knowledge of God and the permanent things, it has to structure its daily life to transmit the Good, the True and the Beautiful. Philosophically speaking, these are the properties of being. The Good, the True and the Beautiful are metaphysical properties. Rooted in being, each transcends the limitations of place and time. We call them the transcendentals. These transcendentals are not contingent upon cultural diversity, religious doctrine, or personal ideologies, but are the objective properties of all that exists. Traditonal philosophy also holds that the transcendental are all convertible. That is to say where one exists, they all exist. Where the good is, there is also the true and beautiful. Where there is beauty, there is also truth and goodness. What you have done in the classroom has certainly given time the encounter the Good, the True and the Beautiful. However, what you have done outside the classroom has had perhaps an even more power effect on your formation. Your formation here at Holy Family Academy has occurred in the encounter with the good, the true and the beautiful that permeate the school’s daily life. In singing in Choir, in performing on stage, in the translating of Vergil, in the pick-up games of basketball, in your relationships and most powerfully, in your encounter at the Altar. I would like to give you another quote to consider. This is a quote from a recent giant among Catholic thinkers, Stratford Caldecott. He unfortunately passed away last year. This is what he says about Catholic education. Class of 2015 and future graduates of Holy Family Academy, I give you a challenge. I challenge you to continue your education and formation in the True, the Good and the Beautiful. We have reflected upon the philosophical nature of formation and connaturality. There is a practical reason for continuing your formation. There is no question that a persecution is coming for faithful Catholics and the Church Christ founded. In the near future, it will become increasingly more difficult to live our Catholic faith publicly and live according to conscience. You will need more than reason to judge how to live according to conscience. You will need connatural knowledge to best judge when not to lash out against injustice because of its futility. And you will need that same virtue in your hearts to know when a moral absolute compels you to risk your reputation, career, family and even your life to uphold the Truth. There is also a Christological reason for thirsting for more—thirsting for more education and formation in the Good, the True and the Beautiful. In the Gospel of John, Christ says “Ego sum via et verita et vita.” I am the Way and the Truth and the Life. Among other things, Christ is saying “I am the Good, the True and the Beautiful. When you pursue the Good, the True and the Beautiful, when you allow yourself to be formed by the Good, the True and the Beautiful, you are being formed by Christ Himself. In other words, education and formation is really pursuing Christ with your intellect, your appetites, your imagination and your relationships. I want to leave you with the words of Blessed Mother Teresa of Calcutta and the words deserve a little introduction. Many people do not realize that she received locutions during her life. She heard the words of Christ in her prayer and meditation. These are some of the words that Christ spoke to her on one occasion. These are the words that Christ speaks to us everyday. And I want you to know that whenever you invite Me, I do come – always, without fail. Silent and unseen I come, but with infinite power and love, and bringing the many gifts of My Spirit. I come with My mercy, with My desire to forgive and heal you, and with a love for you beyond your comprehension – a love every bit as great as the love I have received from the Father (“As much as the Father has loved me, I have loved you…” (Jn. 15:10) I come – longing to console you and give you strength, to lift you up and bind all your wounds. I bring you My light, to dispel your darkness and all your doubts. I come with My power, that I might carry you and all your burdens; with My grace, to touch your heart and transform your life; and My peace I give to still your soul. I Thirst for You. Yes, that is the only way to even begin to describe My love for you. I THIRST FOR YOU. I thirst to love you and to be loved by you – that is how precious you are to Me. I THIRST FOR YOU. Come to Me, and I will fill your heart and heal your wounds. Ladies and gentlemen, why should you thirst for Christ as you continue your education? Because Christ thirsts for you.